So why are these flower parts my favorite part of this entire post? Because they are edible. In fact, they are my Easter dinner dessert. I will share more about them in a bit. I absolutely loved the Easter decor at JOANN this month. 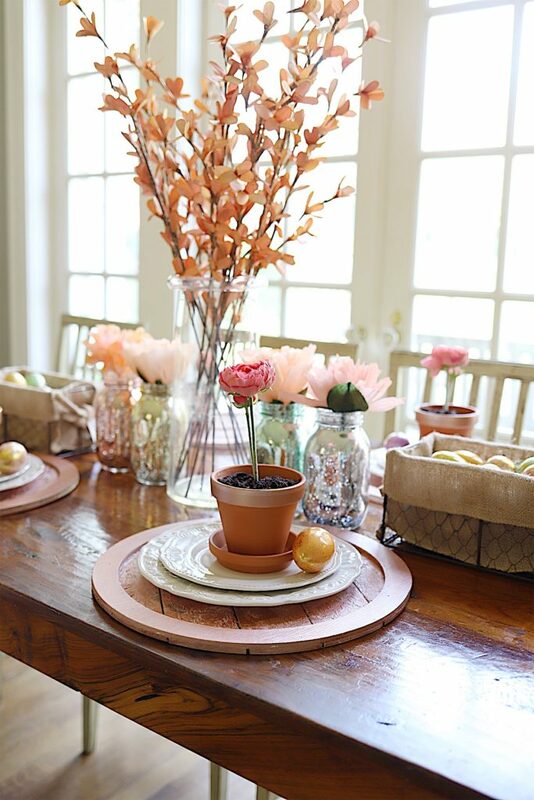 I found so many great items to create this tablescape! 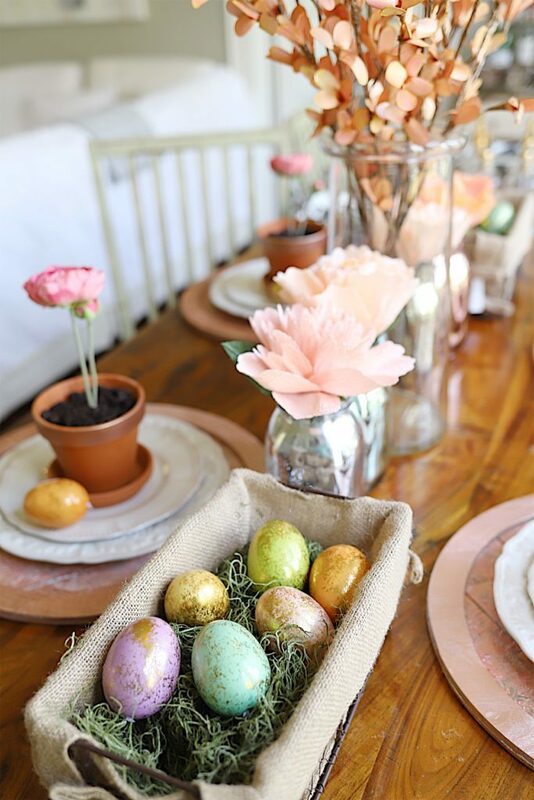 I bought the tall Gilded orange lilies stems, round wooden charger (or sign), mercury glass mason jars, clay flower pots, wire and burlap Easter baskets, green basket grass, round wood tray, metallic Easter eggs, and heavy crepe paper for my paper peonies. 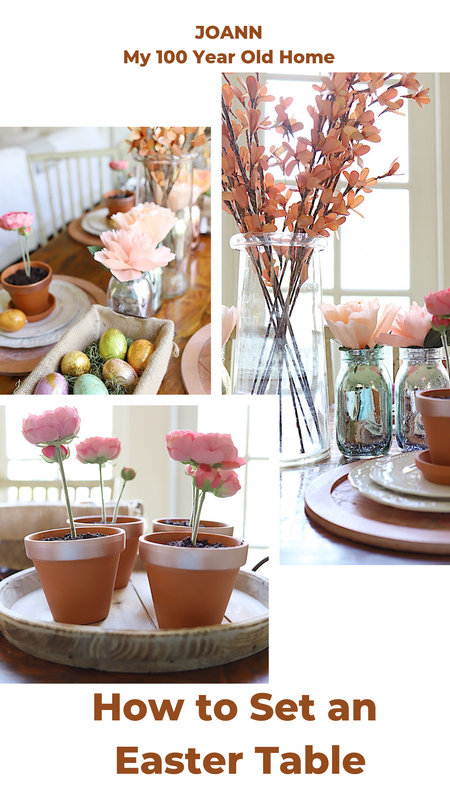 Each of these items had a huge part in how fabulous my Easter table came out. 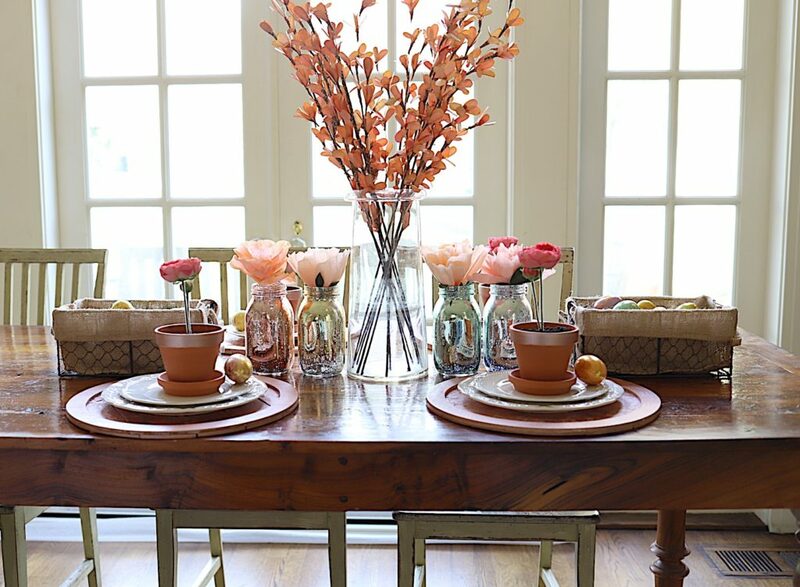 This table would work for Easter brunch, lunch or dinner. Although, I suggest is that you wait to serve the flower pots until dessert! 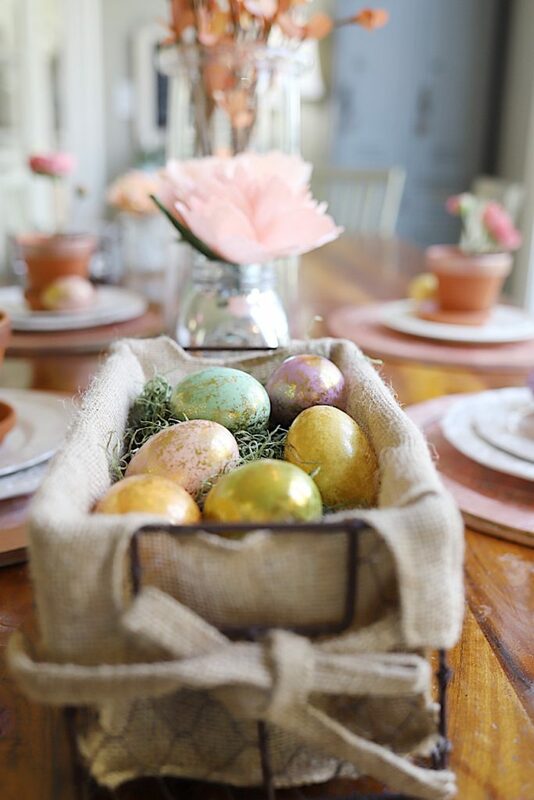 My inspiration for this entire table came from these Easter eggs. 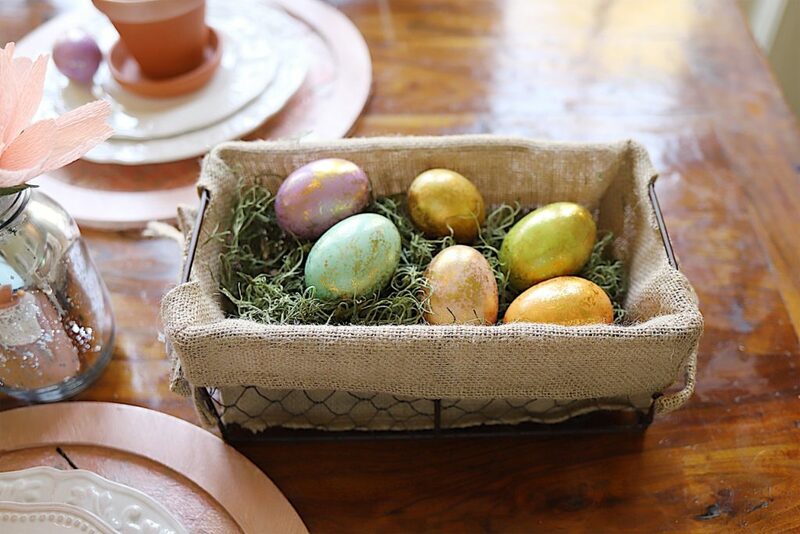 I had originally planned on dying my own eggs but when I saw these foiled eggs, I knew there was no reason to do a DIY. These eggs were perfect. I love the colors and I love the metallic. 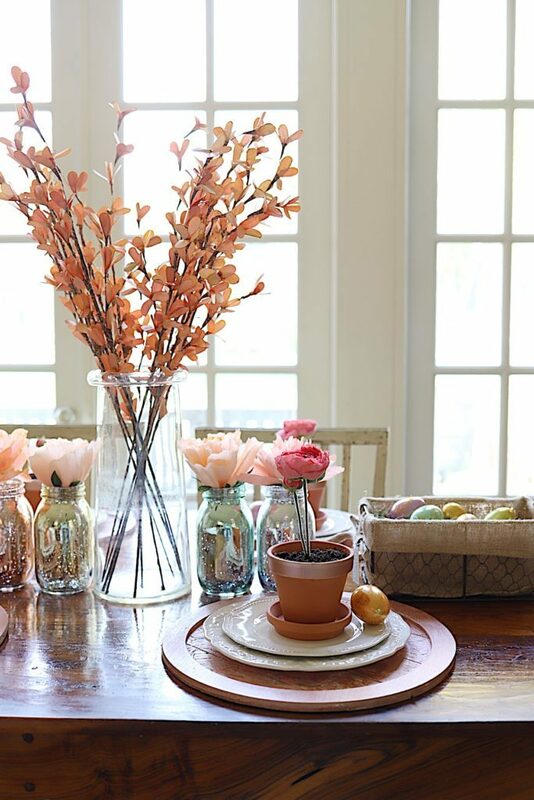 So with the eggs in hand, I shopped the rest of the aisles at my JOANN store looking for everything I needed to create an Easter table. I absolutely love these wire baskets with burlap liners. They make the perfect Easter baskets, especially with this green Easter basket grass. I knew I needed some type of tall floral and these Gilded Orange Lilies are beyond perfect. The only problem with these flowers is that I want them in every room. I will be going back to JOANN soon to find some more. 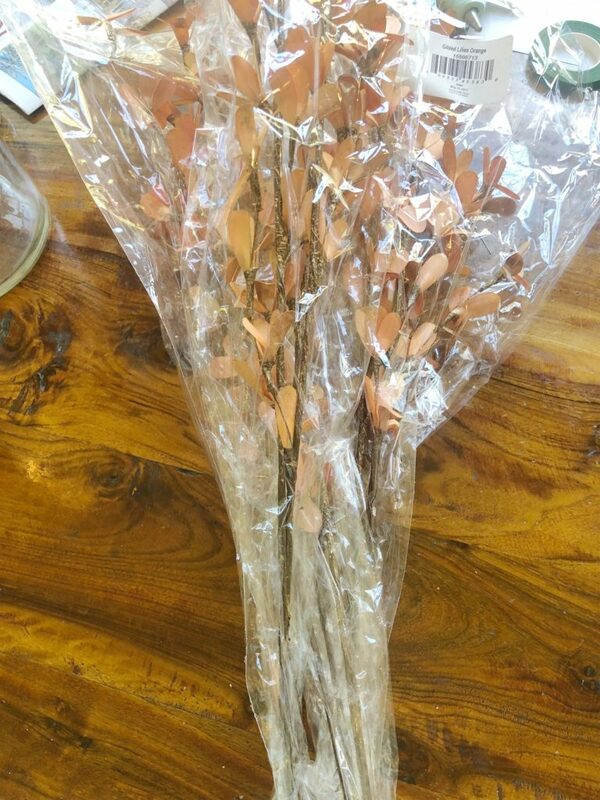 Don’t they look fabulous in this tall vase? As I was heading down one aisle I saw these mercury glass mason jars and about died! They matched the Easter eggs perfectly! 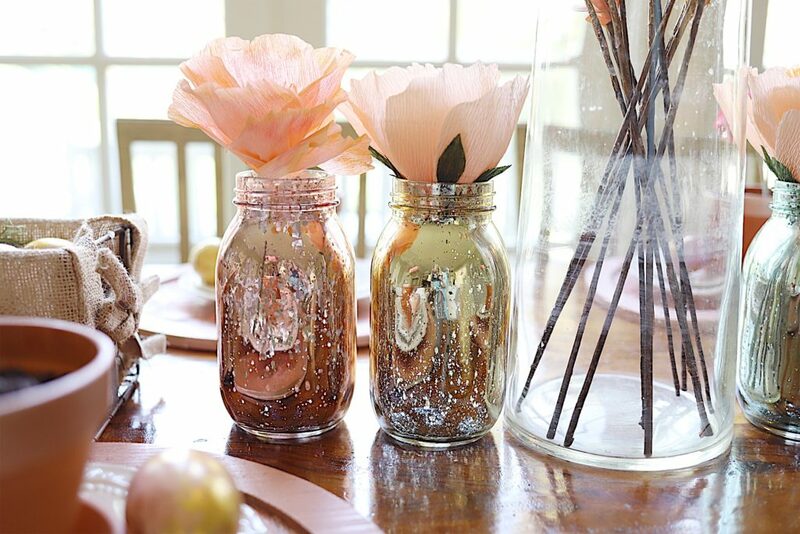 I made some paper peony flowers out of heavy crepe paper to go in these mercury glass jars. You can find the DIY tutorial on my blog later this week. 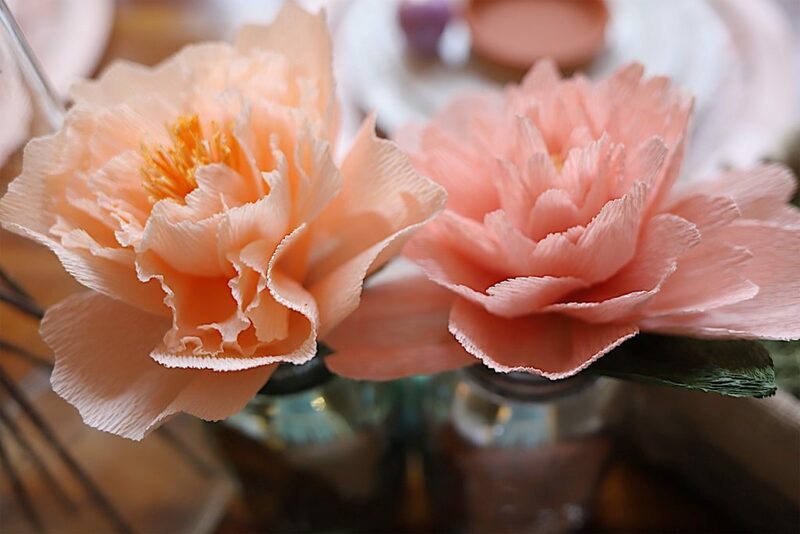 Is it just me, or do these look exactly like a real peony? 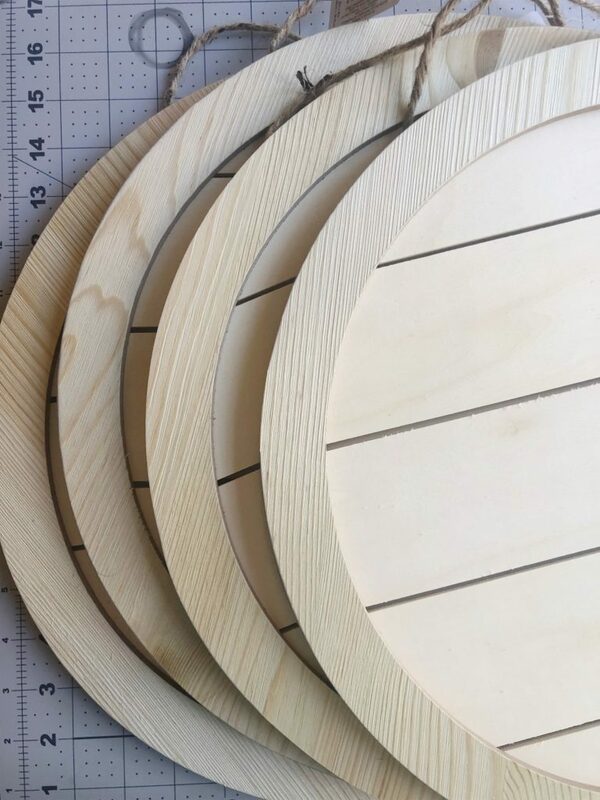 I found these wooden wall hangings and thought they would look fantastic as shiplap chargers. (They also have square ones.). I painted one of the chargers white (because I love white chargers!) and it just didn’t work with my table. So I ended up gluing paper napkins on the center of the tray to create texture and then I painted them with copper metallic acrylic paint. 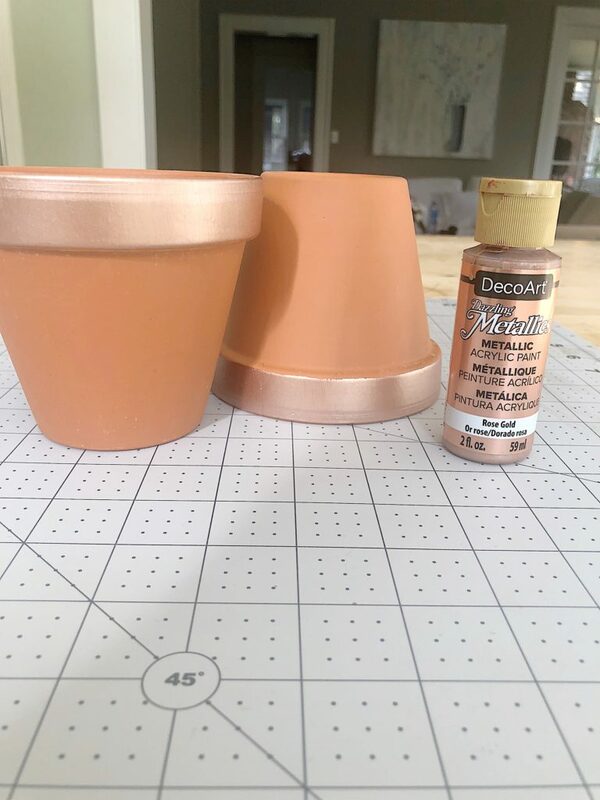 I found these clay pots at JOANN and painted the outside rim with the same copper metallic paint. This was so easy to do as it took about five minutes to paint the six pots. And I love how great they look. 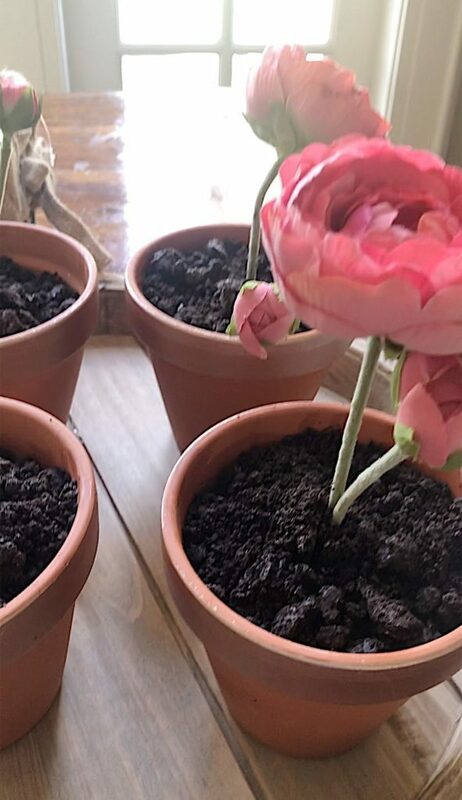 Many, many years ago when I was about ten years old, my mother and I made these ice cream flower pots for one of my birthday parties. I haven’t seen or thought about them since and a few months ago the thought popped in my head that they would be fun to make. 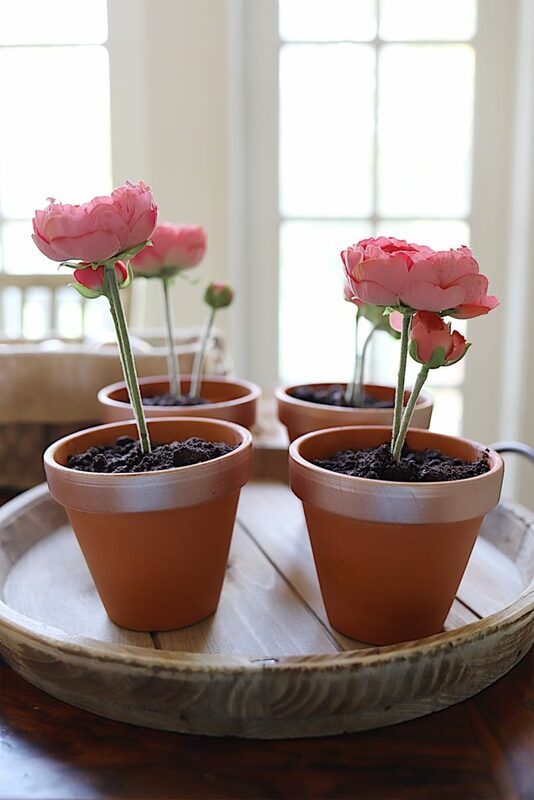 They look exactly like REAL flower pots and it’s funny if you just start eating one! You can see from this angle how authentic they are. 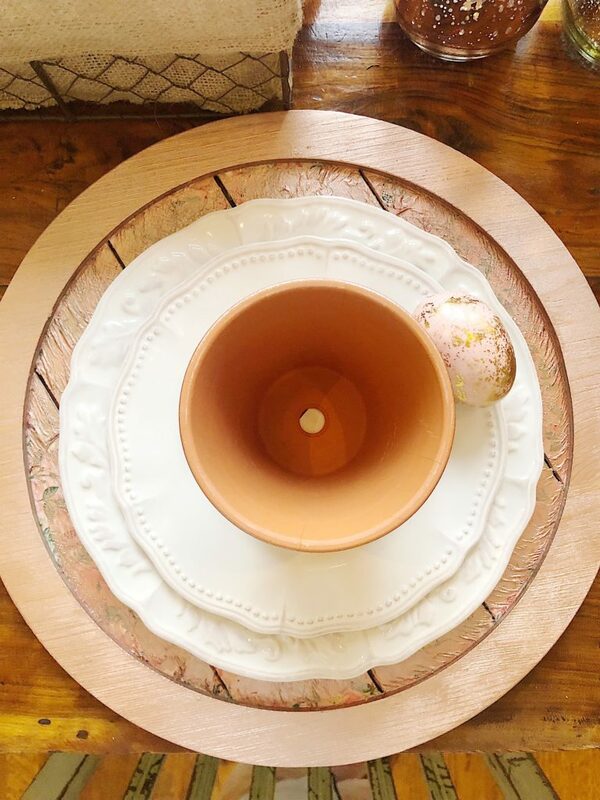 And look at the round rustic wood tray I found at JOANN. Isn’t it wonderful? 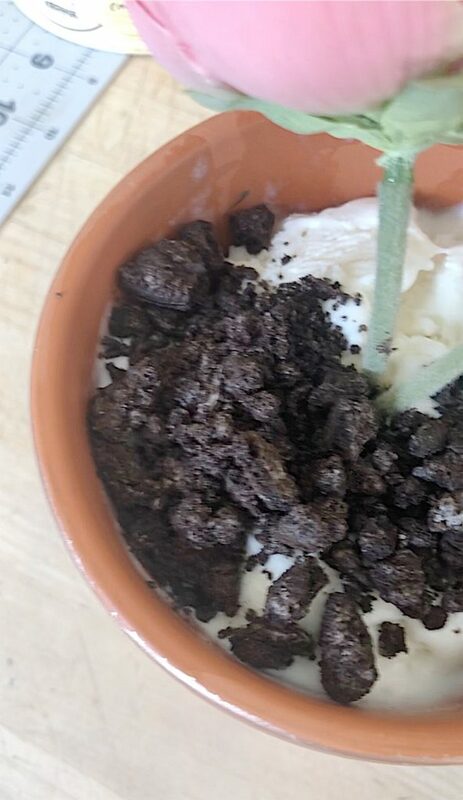 The dirt is actually crushed up OREO cookies. 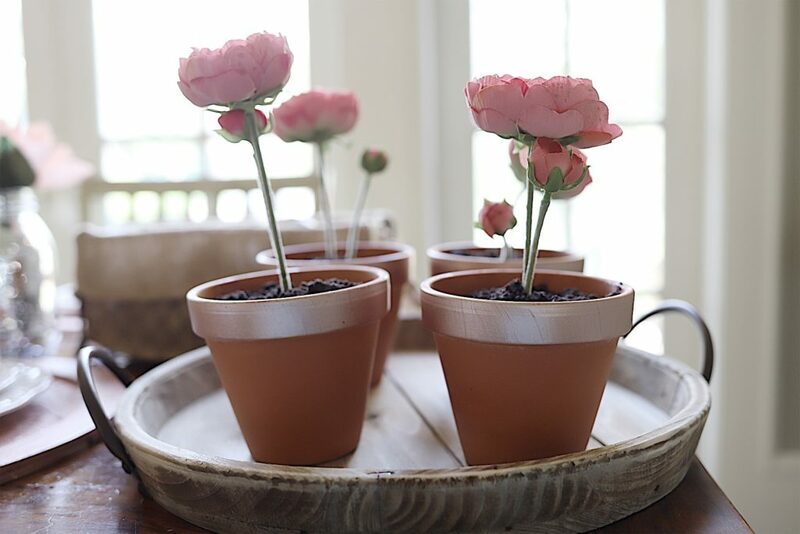 You can find the complete tutorial on how to make these Ice Cream Flower Pots here. 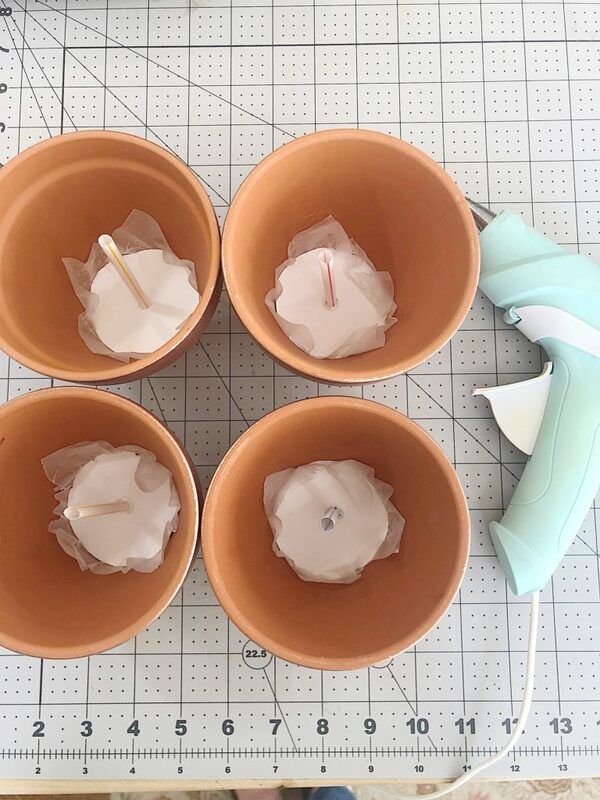 But just so you know, you need to plug the hole in the bottom and use a straw for the flower stem to sit in. Then you fill them up with ice cream and ground up Oreos. 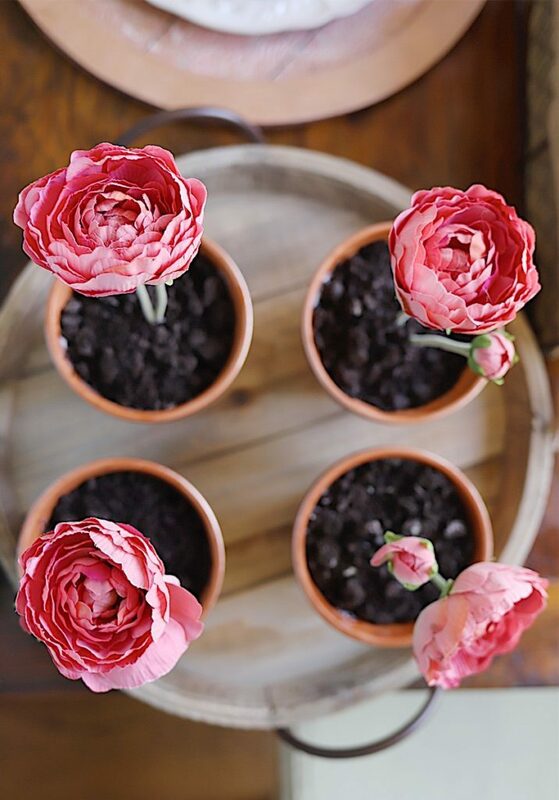 I love how they look with my “faux” ranunculus. I cannot wait for Easter. 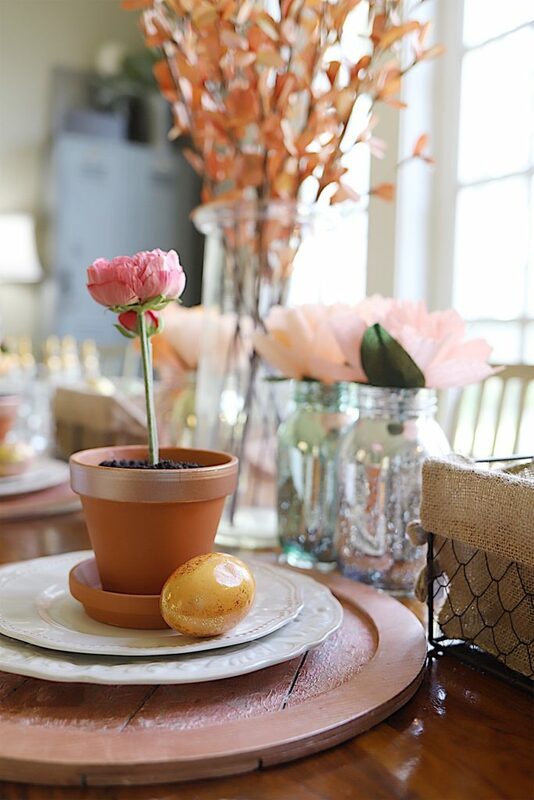 This is going to be such a wonderful Easter Dinner and I love my Easter table decor. And the fun dessert too, of course! 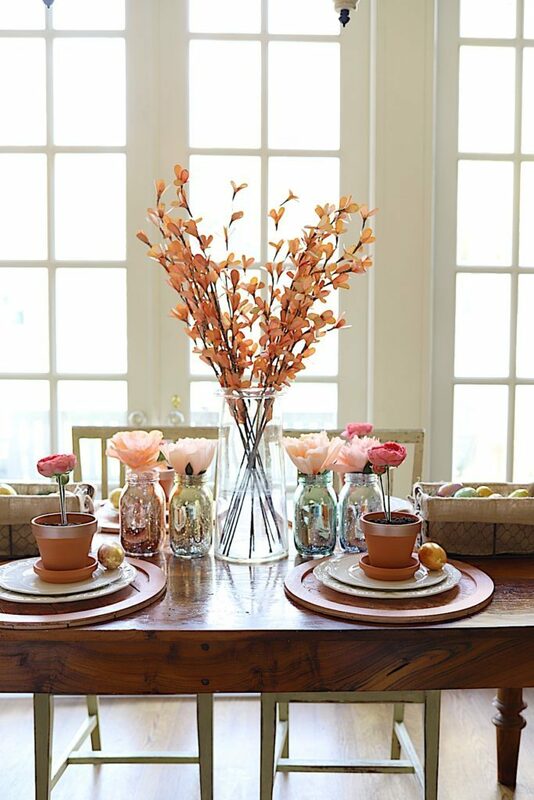 Ithe table looks very pretty. Thank you fir your tips for how you created it. 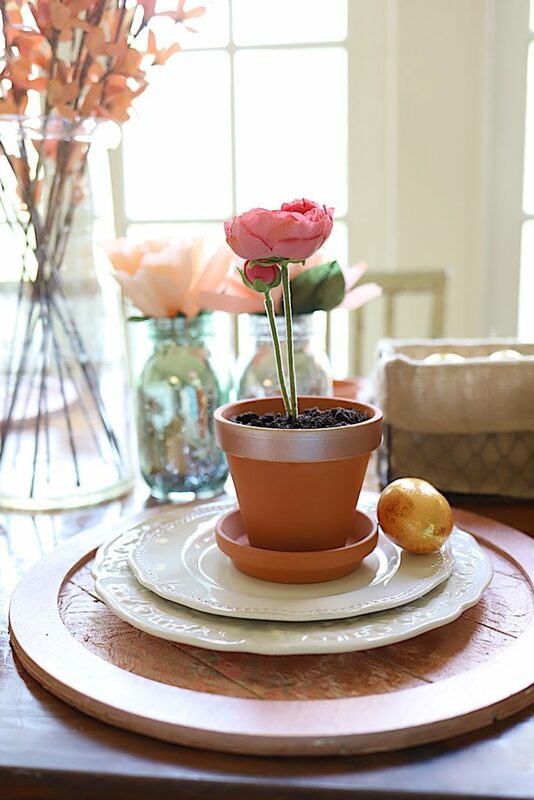 Very pretty I love how you put all that together..
Love it, Leslie.. the ice cream flower pots have been around 50 years, being served at either a graduation party or bridal shower I went to! But the ranunculus flower is a lot more sophisticated than the daisy! 😂 I would use a nest for the gilded eggs..
Keep up the creative work-and I love your calming voice.. Thank you!